One of my favorite trees here on the farm is Osage orange, Maclura pomifera. It is decidedly not majestic. It is not nicely shaped nor does it have great fall color or beautiful blooms. In fact, it is downright homely as trees go. But is has fabulous fruit! Osage oranges are softball sized, lime green orbs that look like brains. I cannot believe Tim Burton has not found a use for them in one of his horror movies. Even though the tree is closely related to mulberry and fig, the fruits are inedible for humans. My deer love them, though. 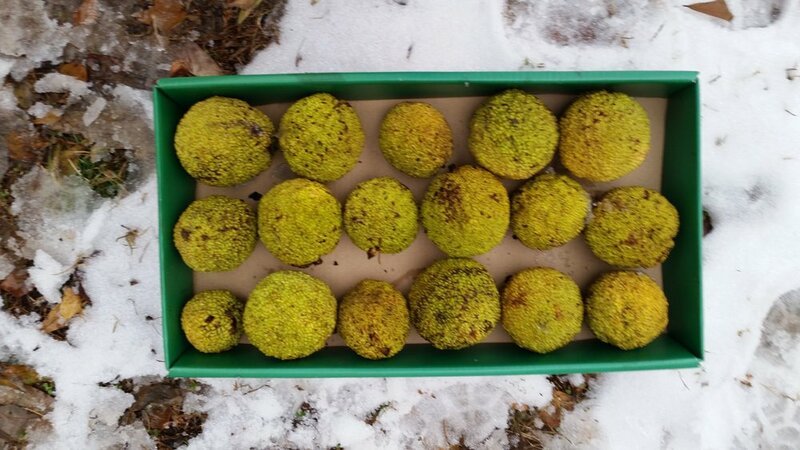 Osage orange is cold hardy in zones 4 to 9. Native to North America, it can be found in almost every state. Trees grow 30 to 60 feet in height. Also called hedge apples or horse apples, the fruit gained its name because the Osage Indians used the wood to construct bows. The wood is hard and tough. The tree is gnarly, twiggy and uneven in growth, so it is not recommended as a home garden specimen. If you have a woodland area, as I do in the Mary Snoddy garden, you might want to plant several. Why several? The Osage is dioecious, which means that both male and female trees are required for fruiting. Plant it where you won’t brush it when mowing or walking. It hides wicked thorns along its branches. Broken twigs exude a milky sap that causes dermatitis. It is an understory tree, enjoying a bit of shade from taller neighbors. It is easily transplanted and tolerates heat, drought, bog and pH extremes. Trees must have a certain level of maturity before they start bearing fruit. I could not source them in any local nursery. I planted five mail-order trees fifteen years ago. They grew rapidly, but have only been bearing fruit for the last eight years. The fruits were tennis-ball size during the first two seasons, but now average softball or grapefruit in size. They exude a slight citrus odor. Fruits fall to the ground when ripe, which is another good reason to plant them in an out-of-the-way site. A ripe fruit would hurt if it landed on a person or damage a car parked underneath. Folklore says that the fruits will repel spiders and cockroaches, but studies have dispelled that as myth. Even stranger is the myth purporting the Osage orange as a cure for cancer. The fruits mature in autumn, where they look good in Thanksgiving arrangements containing gourds and pumpkins. I always push the storage limits, using them with nandina berries, pine and magnolia leaves for Christmas decorating. Once indoor in warm temperatures, the fruit passes from pleasantly scented to odiferous in two weeks or so. A great conversation piece.